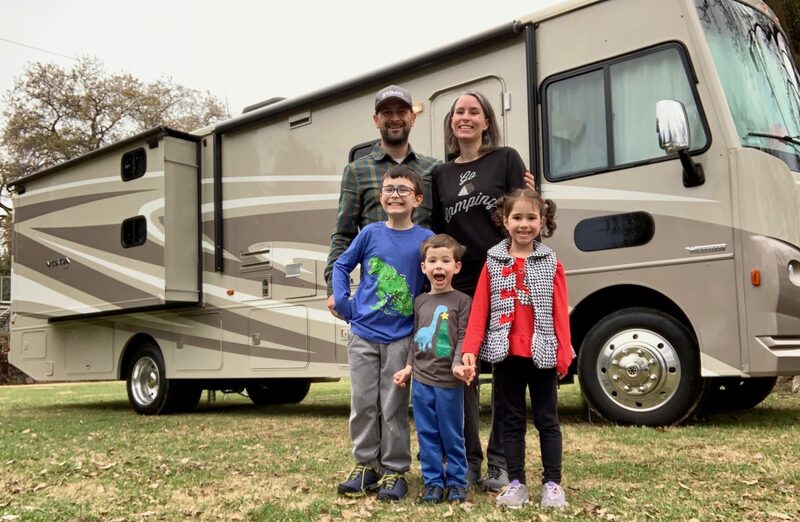 You know you might have really lost it this time if… your spouse comes up with a crazy idea like, “let’s downsize from our 2500 sq ft home in suburbia to an RV and live on the road” and you’re actually considering the idea as a viable option. Now I know (now) that people do this type of thing all the time. But “people” are usually 60+ yrs old retired grandparents traveling around the county visiting their children and grandchildren perhaps toting along a beloved pet. “People” are not raising 3 children ages 2, almost 4 and 6. That, my dear friend, would be “crazy”! I’m sure that, on occasion, you or your spouse has come up with some silly idea and the two of you have talked about doing something crazy but you always wake up the next morning and laugh about it together. The morning after my husband had the idea, we started downsizing and took a van load of stuff to the thrift store. So began “phase 1” of the new plan. Phase 1: Downsize drastically. Phase 2: work out the finances, job, budget for RV etc… Phase 3: shop for an RV & sell the house. Phase 4: Downsize drastically again, this time to fit our family of 5 into an RV. Phase 4 includes selling large items that we wouldn’t need if we didn’t have a house. Phase 5: put some things in storage & hit the road. See the crazy part about the whole idea is that we actually came up with a plan to make it happen and started to carry out the plan the very next day! Of course, we can always downsize a bit and change our minds but something about this doesn’t seem like that is going to happen. So where in the world did this crazy idea even come from? Maybe its that we already left our family in friends in CA when we moved to NC in Jan. 2016. Maybe its that after 6 months in our new home things just don’t seem to be working out like we’d hoped they would. Maybe its the hope that we’d be able to put more money towards paying off our student loans ($150,000). Maybe its because we are already a homeschooling family and it seems like a great adventure for our family. Maybe its the call of the wild and the effects of listening to the Okee Dokee Brothers non-stop! (Their latest adventure music album was released May 2016 and my kids have most of the songs memorized. We are going to see them live in concert next month.) Maybe we “really” “have” lost it this time! I’ve been reading a blog called Newschoolnomads written by a mama who lived in an RV with her family for 4 years. Here is a short Video of RV-ing with kids that they made. So I guess it can be done… I just still think its pretty crazy to consider it being done by me (I’m whatcha call an “indoor” girl)! At any rate, I wanted to capture the moment just in case we actually go through with it.